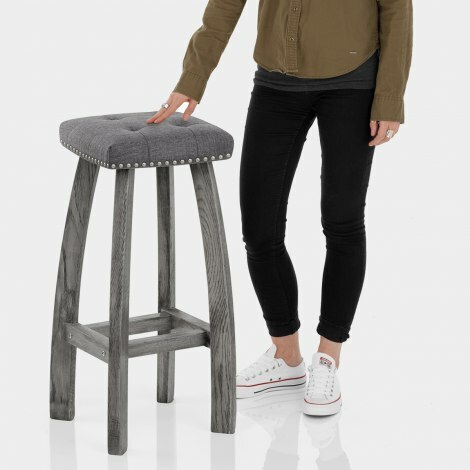 Admire the classic beauty of the Cromwell Bar Stool Charcoal Fabric, a unique fixed height design with an original look and stylish sense of elegance. Mixing old and new with an incredible result, the Cromwell is an amazing item for your kitchen or bar area. 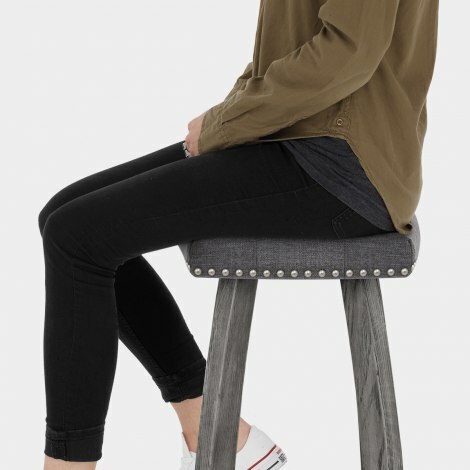 Backless and padded, the charcoal fabric seat offers a comfortable experience without occupying too much space. What’s more, metal studs and stitch detailing are an opulent addition. This compact design can also be placed underneath the counter after use. The solid oak frame sits nicely at kitchen worktop height, with the four legs adjoined by four bracing bar footrests. A grey finish adds to the design and brings a sense of modernity.